A few weeks ago I attended a blind wine tasting. Take my word for it, it was fun and informative, but if you don't quite believe me, you can check out my post here. Wine should be fun not intimidating or overwhelming. One of the best ways to get to know wine is to host a wine tasting. Whether you're a novice or an expert, a wine tasting is a great way to get together with friends and share some laughs as well as wine knowledge. Inviting a cross section of your friends will keep the party and conversation lively. Keep the number of wines between 6 and 8. You can certainly invite more than 8 guests. If you do, have every 2 guests share the cost of one bottle of wine. The wine tasting I attended was kindergarten moms who were getting together for the first time outside of class parties and activities. It was a great way to get to know each other and to get to know wine. Send invitations using evite.com. Make suggestions for varietals to bring. Ask guests to post the varietal that they will be bringing in their reply so that there are no duplicates. When using evite.com, every invitee will be have access to the replies and the types of wines that each attendee is bringing. The last thing you want at a wine tasting is a bunch of duplicates. For example, if you were planning to host a white wine tasting, you might suggest the following list. Include the varietals of wine that will be featured at the tasting. The tasting card should include a brief description of each type of wine. Make space below each description to record tasting notes such as appearance, aroma, and flavor. To make the tasting challenging (and even more fun) have a blind tasting. 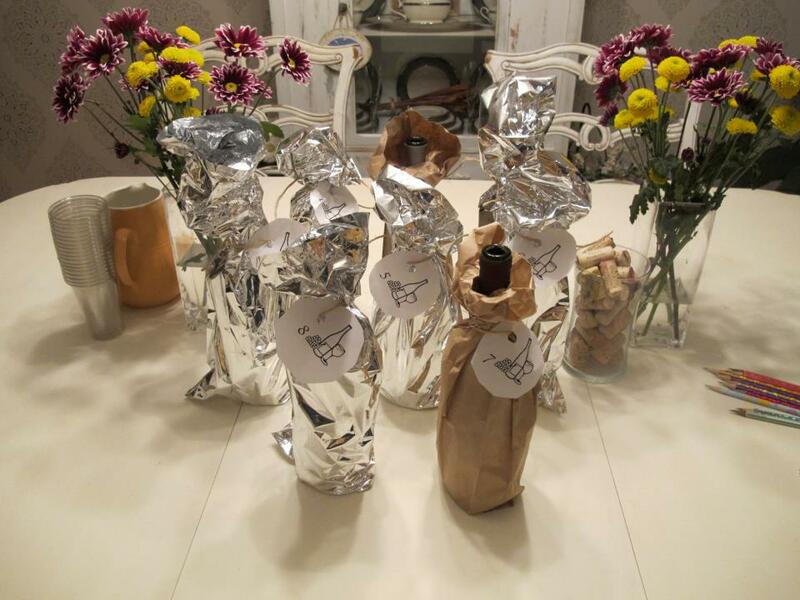 Asks guests to bring the bottles already wrapped in foil or a brown paper bag. The host will number the bottles prior to the tasting. The guest who is able to correctly identify the most wines wins a prize (a favorite bottle of wine, a wine accessory, or a book). Guests can pitch in prior to the tasting for the prize, and the hostess or another guest can volunteer to purchase it. I probably should have listed this as #1. It is a must at any wine tasting. Ask each guest to bring a favorite appetizer or finger food to enjoy before the tasting gets started. Wine and cheese are synonymous together so be sure that at least one or two people bring a few types of cheeses. And of course, I'm a big fan of wine and chocolate together. I always volunteer to bring the chocolates! There is nothing worse than a wine snob. It's a huge turn-off for me. While I do enjoy someone who is knowledgeable about wine, I don't like a wine snob. If you consider yourself an expert, leave the judgement at the door and come to have a good time and impart your insights on others in a non-condescending manner. Trust me, everyone will appreciate your expertise if shared in a way that is not threatening. After all of the wines have been poured and tasted, remove the wrappers from each bottle and tally the correct guesses for each person. This is the best part of the evening. I thought I had at least 4 wines out of 8 correctly guessed. I was confident. As it turned out, I had 1 correct guess. Haha! - Give each guest one wine glass and one water glass. - Keep a pitcher of water on the table at all times so that guests can cleanse their palettes in between wines and rinse their glasses between pours. - Serving plain bread and plain crackers is a great way for guests to cleanse their palettes as well. - Keep a bucket on the table so that guests may discard any undesirable wine between pours. - Serve 2 ounces of wine per glass, per tasting for each type of wine. - Above all else, have fun!! !